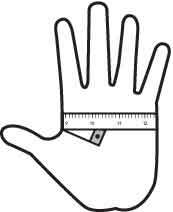 Measure around your hand above the V of the thumb. This gives you the circumference in inches. Compare it to the measurement table below to find your corresponding glove size. If your measurement falls close to, or between two sizes, we recommend that you order the next larger size. Example: If your measurement is 7" (high small / low medium), you should order a size medium. If you do not have a flexible ruler, you can click the image below to download a printable ruler to which you can use for measuring. Click image below to download a printable PDF Printable Ruler. You must print the PDF at 100% (Actual Size) to ensure you have a true 12" ruler when cut. Cut closely along the outer line of the ruler. Measure according to the hand image above. 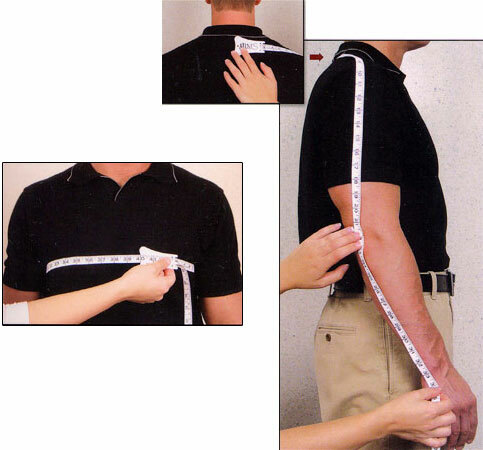 Take the chest measurement by measuring under the armpits around the fullest part of the chest. Take the sleeve measurement by starting the tape just below the neck, centered with the spine. Make sure the tape measure goes over the top of your shoulder. Take the tape down the arm to the point of your elbow and then measure an inch and a half past the wrist bone. It is always better to measure long versus short because a sleeve that is too short will likely be uncomfortable. Compare it to the measurement table below to find your corresponding chest or sleeve size.